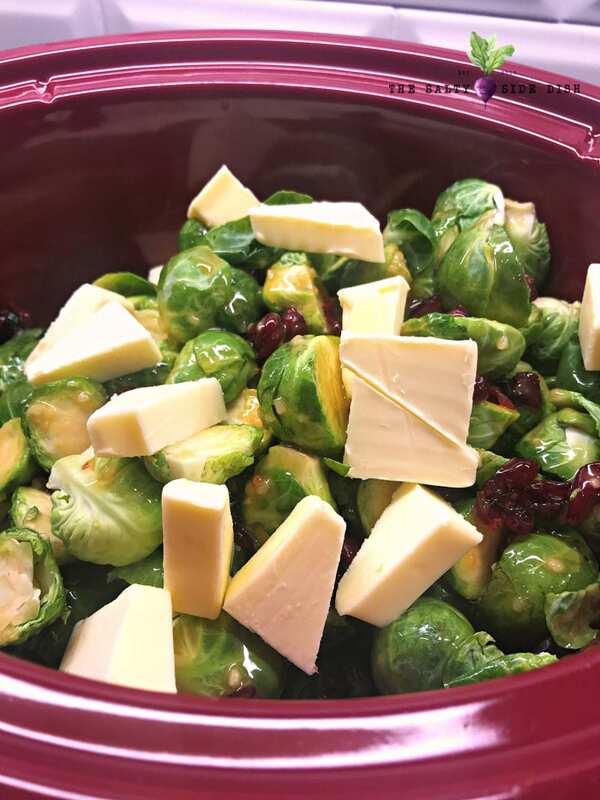 Honey-Dijon Brussels Sprouts, a festive sweet brussels sprouts side dish in a slow cooker, is a gorgeous sweet vegetable dish perfect for holidays. You will love how the honey and dijon combine to make this one of the seasons delicious ways to enjoy your greens. Now that Thanksgiving has come and past, I wanted to talk about some of the wins for our side dishes! I don’t “work” on the holidays, but I do try to snap a few pictures in case a recipe works out, so you are definitely not getting blog quality photos here. But lets face it- things that go in crock pots don’t always LOOK beautiful, they just need to TASTE amazing. When it comes to brussels sprouts, you either love them or you hate them. I think a lot of people grow up and do not love them. I have heard anything from bitter tasting to tasting like feet. I didn’t even try brussels sprouts till I was well into adulthood (like LAST YEAR) and could not believe I was missing out! There are so many ways and so many recipes you can use to serve up amazing tasting brussels sprouts, so if you tried them as a kid, make sure you try them now as an adult and you might be surprised. In the past week I have been experimenting on different ways to cook up Brussels sprouts and we have had some wins. I think maple bacon Brussels sprouts is a pretty obvious way to cook them, but I also crusted with buffalo breading (Buffalo Brussel sprouts recipe – which was amazing) and these delicious Honey-Dijon Brussels Sprouts with cranberries that were so sweet and got tons of Thanksgiving day side dish compliments. Serve along side this main dish meal, Honey Garlic Chicken. 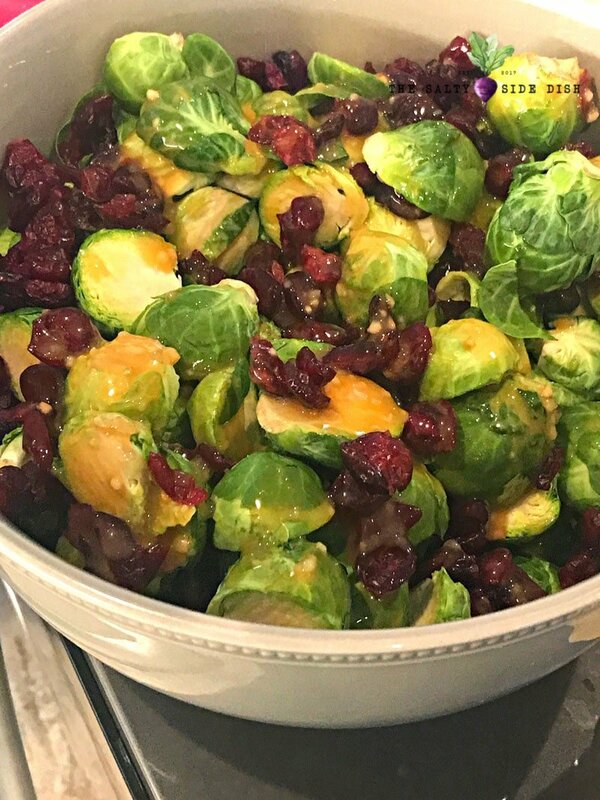 The sweet Honey Dijon sauce poured over the brussel sprouts, combined with the tasty bites of cranberries, make a festive and delicious way to serve a vegetable side dish this holiday season. To prep, cut your brussels sprouts in half. If you happen to have tiny brussel sprouts, you can leave without cutting so they don’t get overcooked. My bags of fresh brussel sprouts had a few teeny tiny ones so I left those alone. Add your halved brussel sprouts into a bowl and set aside. Take out another bowl and combine your Honey Dijon Mustard, Garlic, Salt and Pepper, and honey. Whisk together until combined. 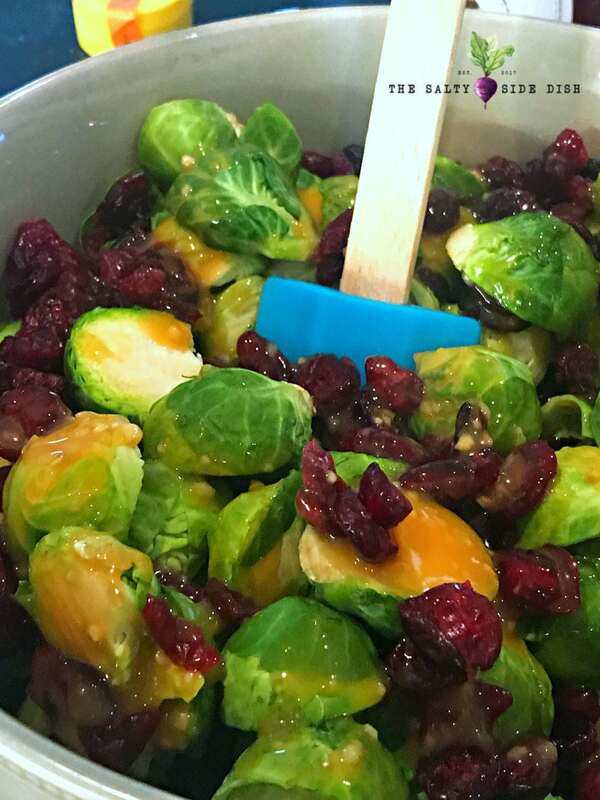 Pour your mixture over your brussel sprouts, add your dried cranberries, and use a spatula to make sure your vegetables are all covered. Transfer your Honey-Dijon Brussel Sprouts to a crock pot. Now add your pats of butter. Set crock pot on low and cook approx 3 hours, stirring in the butter as it melts and then move to warm until ready to serve. NOTE: Depending on the size of your brussels sprouts, it could change the time needed in crock pot. I would test at the 2 hour mark and move to warm if your brussel sprouts are cooked through and still slightly crispy. I personally do not like them super soft, but you can monitor the texture. Can you cook Honey Dijon Brussel Sprouts over the stove? If you prefer to cook up your brussel sprouts in oven so they get a slight charred crisp, that is no problem. Just cook them up, making the sauce on the stove, and combining just prior to serving. Just follow my Roasted Brussel Sprouts Recipe here and then make the sauce separately. Can I boil my Brussel Sprouts? Boiling makes them bitter, so I do not recommend that as an addition to this recipe. 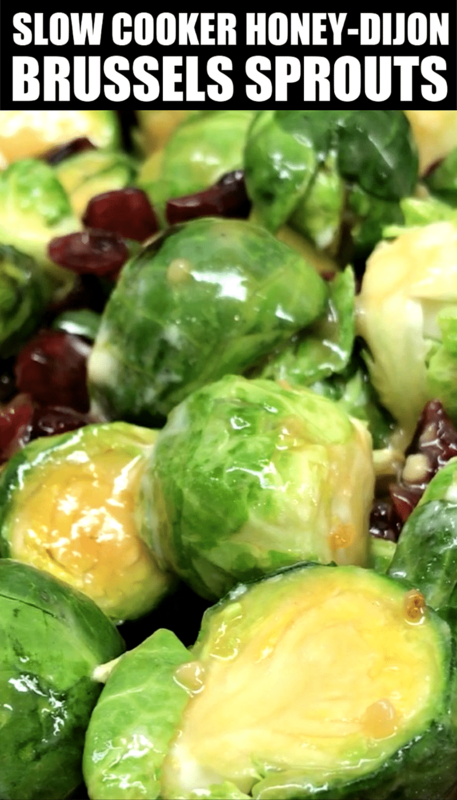 The sweet Honey Dijon sauce poured over the brussel sprouts, combined with the tasty bites of cranberries, make a festive and delicious way to serve a vegetable side dish this holiday season. And in a slow cooker, they are so easy to set and forget! To prep, cut your brussels sprouts in half. If you happen to have tiny brussel sprouts, you can leave without cutting so they don't get overcooked. My bags of fresh brussel sprouts had a few teeny tiny ones so I left those alone.